Let the rites of sacrifice begin anew! 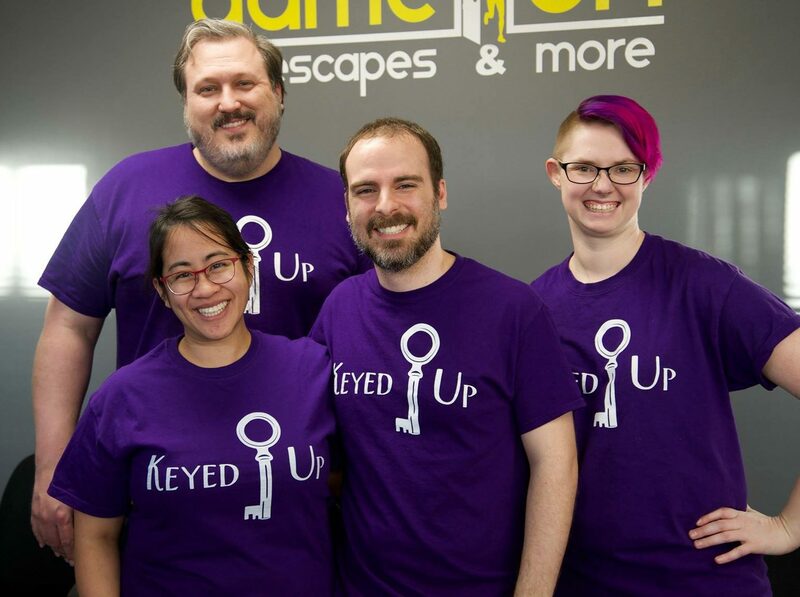 Once upon a time, there was a group of enthusiasts who encountered an adventure they loved so much, they dedicated the back of their team shirts to extol the virtues of that unfortunately retired room. Over a year later, The Final Sacrifice remains our group’s favorite room. So much so, in fact, that our erstwhile regular teammate and Dallas correspondent Cathy returned to NC specifically for our trip to experience the new sequel room, Baruta’s Revenge. We are truly children of Baruta. Expectations were high for this bigger budget cult sacrifice extravaganza, and it was our first stop during our recent trip to Charlotte, NC. But how’d it stack up? The Ouija board from the original Final Sacrifice. We pay tribute to it’s wisdom. Exit Strategy North is well known as the bigger budget, more Hollywood style rooms in Charlotte, and they did not disappoint in this regard. A huge, beautiful set, full of excellent lighting and sound effects greeted us upon our deliverance into the sacrificial chambers. The storyline has also been expanded, providing an excellent follow up to the theme through great voice work and the reintroduction of some old foes. The opening to the room is also fantastic, incorporating some acting similar to that we experienced in the original Final Sacrifice and immersing us into the game splendidly. Another, perhaps unintentional, callback to The Final Sacrifice is how the game itself explodes forward into a frantic run of great puzzles in the latter half, bouncing the group from spot to spot in an exciting run of solving we really enjoyed, save for one specific road bump. Fans of the original game are going to love the many call backs hidden within Baruta’s Revenge, from the sacrificial chambers to the fantastic storyline, and it’s worth playing just to experience those now nostalgic beats in the game play. Props are a lot of fun to manipulate, and the physical nature of most of the room plays to the strengths of the theme. We even get some interesting backstory on Baruta himself, as well as an insight into the identity of our supernatural savior from the original game, which was a great touch. In fact, there’s a lot to build on here, and we’d love to explore the lore of these games more in the future. That being said, one of the legacies of The Final Sacrifice is just how difficult it was, demanding a level of teamwork that challenged us without being overly obtuse. Unfortunately, the difficulty of Baruta’s Revenge doesn’t arise from clever teamwork challenges or devious puzzling, but more from the many thin logical leaps that must be made. Many times we were expected to know something for seemingly no reason other than we should know. I call this “because reasons” puzzling, which is when a room incorporates an interaction without including a reason why within the game flow. For example, there were several moments we had to chant a phrase, but were never directed to it naturally, we just did it “because reasons.” Once, there was a puzzle and lock in a room we had been told we weren’t supposed to go back into, we were just supposed to know to go back in there “because reasons.” (Granted, this could be an error in GMing.) Later, we asked why we were supposed to know to do these things, and the Game Master was unable to give us a satisfactory answer beyond, “everyone needs a hint in this room,” which we feel was another failing. Rooms should be solvable without clues, otherwise, there is some failing in the design. A lot of times, we felt like we were fighting with the puzzles, a few of which were specifically harder for no other reason than they were difficult to see. Again, we ran across a color puzzle in a dim room. Spotlights had been added to assist, but it wasn’t quite enough to illuminate the differences to an acceptable level. Another involved reading something that was far away and extremely small, frustrating even those of us with the best vision. An ongoing problem in many Exit Strategy rooms hasn’t been alleviated, as there is nothing to write with within the room, which is always frustrating. One of the biggest determinations of a room’s quality comes from the Game Master and how they read a room. Unfortunately, our game master read our frustrations and requests for help with some of the more obtuse puzzles as time to start cracking wise. Had these barbs of sarcasm been followed up with a hint, perhaps that would have been ok, but frustrating your players further is never a great idea, and only served to diminish our experience. I get that Baruta is a bad guy, but when your game has stopped becoming entertaining and lapsed into frustrating, it’s your job to help get things back on track, not exacerbate the problem. Based on word count alone, it might look like we hated this room, but honestly, there’s a lot to like here, and I feel like there is a great foundation to build upon, especially if some of the more glaring issues are taken care of. Is Baruta’s Revenge a worthy follow up to The Final Sacrifice? Maybe not. But is it an overall pretty good room? Yes, definitely. I absolutely do not recommend beginners take this one on, however, as it truly is very difficult, but enthusiasts and fans of the previous room will definitely get a kick out of the experience. You can book a rematch with Baruta here! Are people in this one chained down for some time like in Final Sacrifice? I didn’t like that because those people missed out on some of the game play! Jessie, nope, no one is tied down during this one, which is good gameplay and safety-wise.